William H. Turner was born in Kansas City, Kansas, February 1, 1937 and was a member of the Antioch Baptist Church. He was baptized at the age of 12 by Pastor Willie Banks, Sr. Deacon Turner is a Graduate of Gamaliel Christian Bible Training Institute. He served in the United States Marine Corp (USMC) from 1956 -1959. When he returned to Kansas City, Kansas he joined the Forest Grove Baptist Church. He served as a Deacon for 25 years at the Forest Grove Baptist Church with his father. For 20 years he served as the chairperson of the Deacon Ministry with Pastor James Sharp and Pastor Cecil E. Poe. Turner is also a choir member with the Community Baptist Church Choir (COMBACH Choir), Ambassadors For Christ Choir (Men Choir). 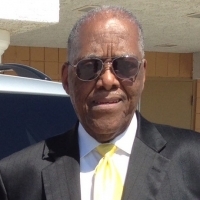 He served as a Deacon for 13 years and 10 years as the Chairman of the Deacon Ministry. He is also the instructor for the Men of Faith Bible Study Class. He has served faithfully for the many years that he has been at the Community Baptist Church.